The two step is a proud traditional dance in Australia. We no longer have a smoke in the left hand to balance the beer in the right, but we still two step left then right and call it dancing. My generic understanding of dance culture was that Latinos shake it, North Americans crunk it and the Brits sit on bar stools. I’m not sure what I expected from the Thais, but I thought it would involve some hand jive talent synchronised with taking photos of each other. I’ve just returned to Chiang Rai after spending 3 days with mum and dad going through the mountains and border regions of Nothern Thailand. It was fun spending time with them and relaxing to tour in a car and appreciate the engine labouring up hills and the rain hitting the windscreen instead of me. I waved goodbye to mum and dad as they left in the back of a share taxi headed for Chiang Khong on the Laos border. The driver had one eye and they were sharing it with an old guy that smelled like urine. Apparently the trip was good. Back in Chiang Rai I found a cheap backpackers above yet another reggae themed bar and headed out to the Saturday night markets for dinner. I’ve been loving the Somtam, green papaya salad. Its green papaya, tomato, onion, chilli and some random unidentified liquids mashed in a mortar and pestle and eaten in your hands with sticky rice. They normally ask how hot you want it and I haven’t worked out the correct answer yet. The Thai amount of chilli makes me cry, the farung (westerner) amount is zero chilli. One of my survival Thai phrases is ‘Nit Noi Pheet’, a little hot. This also makes me cry, but I can hold the tears back if I have plenty of beer to wash it down. I sat down at a table in the market with my somtam, sticky rice and beer from the 7-11 across the road (they open it at the counter for you, thats the convenient part of a convenience store). In front of me was a stage with a singer, percussionist and a backing track. The songs must have been good because there was a good crowd dancing. Thai style dancing. The dancing crowd made Australians look like Latinos. The heads all bopped with immaculate timing but they had all the vigour of an arthritic nanna terrified to break a sweat. The most creative they got was the occasional twirl, and the crowd diligently copied when the dance leaders on stage pulled out the hand barrel roll. The dance move of choice was the power walk shuffle, elbows and shoulders pumping and the feet shuffling forward. The mass of bopping heads had a slow anti clockwise rotation like at rollerways during an uneven hour. At the end of the song the whistle blew to remind them to stop dancing. I finished my beer and the last of my sticky rice and left for he safety of reggae style Shania Twain covers back at the hostel. Back home, we have a fear of plastic bags. We fear the guilt associated with every shopping bag that is used for five minutes to get home but then survives another ten thousand years in landfill. Bunnings now make you take box, Target charges you 10c for a corn starch bag and the supermarkets encourage you to use reusable bags. South East Asia lives guilt free. On the contrary they feel the pride of putting food in a plastic bag in a plastic carry bag, knowing they will support the livlihood of a dump forager, helping them on their way to make 75c a day. Alternatively, that bag will only last a week before it is burned. 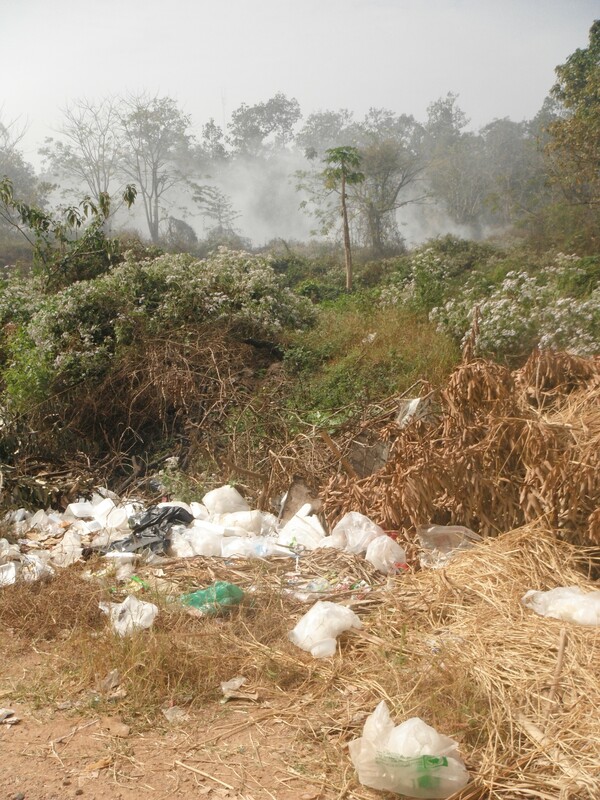 In Vietnam’s Lake Ba Be national park, my tourism degree trained guide was burning his plastic trash on the roadside. I try to avoid plastic. The three standard events for getting it are shopping, bottled water and take away food. Its rare that I’m not carrying a satchel bag that I can dump a purchase straight in, so avoiding the shopping plastic bag is simple. I generally keep an old plastic bag in there for those sticky or sloppy things that do require the protection. Thailand is clever when it comes to bottled water. 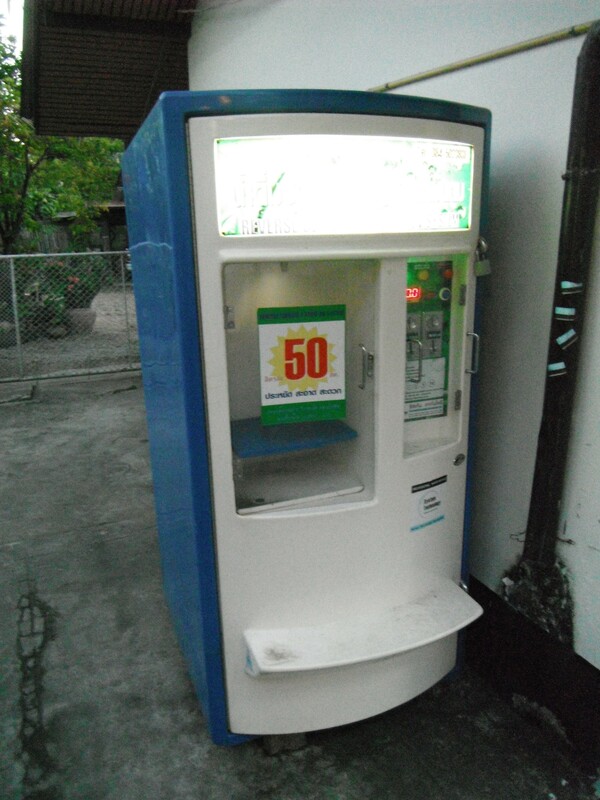 There are regular refill machines that pump out reverse osmosis, UV sterilised water for about a baht a litre. Alternatively, I’ve met people with other tricks like travelling with a portable kettle to boil water every night for tomorrow. My folks normally travel with a steriPen. It would be really hard to completely avoid bottled water, but you can be good at reducing how much you use. In a normal day I can go through 2 to 4 plastic bottles of water. In Thailand probably half of those are refills. In Laos a lot of guesthouses provided water so I could fill in the morning and use refilled bottles about a quarter of the time. Takeaway food is normally served in a polystyrene container with a bonus sheet of plastic tucked in the bottom to stop chopsticks piercing through. Its then tucked safely in a plastic bag. Its almost more plastic than food. I’ve started carrying my own takeaway container. Its a tower of tins or tiffin. The locals know them and makes it easy to explain take away lunch in charades. The problem is that they aren’t on the same wave length as to why I use it. I’ll open it up at lunch to find the rice has been put in a plastic bag inside the tin. Even when I try, I still go through a rediculous amount of plastic. Each guesthouse I check out of is left with a bin full of plastic and me wondering if the dump foragers will get it for recycling or if it will be burned. Its the smells that stay with you. In a car you have the air conditioning on, on a motorbike you’re going too fast. On a bike you get to smell the world around you. 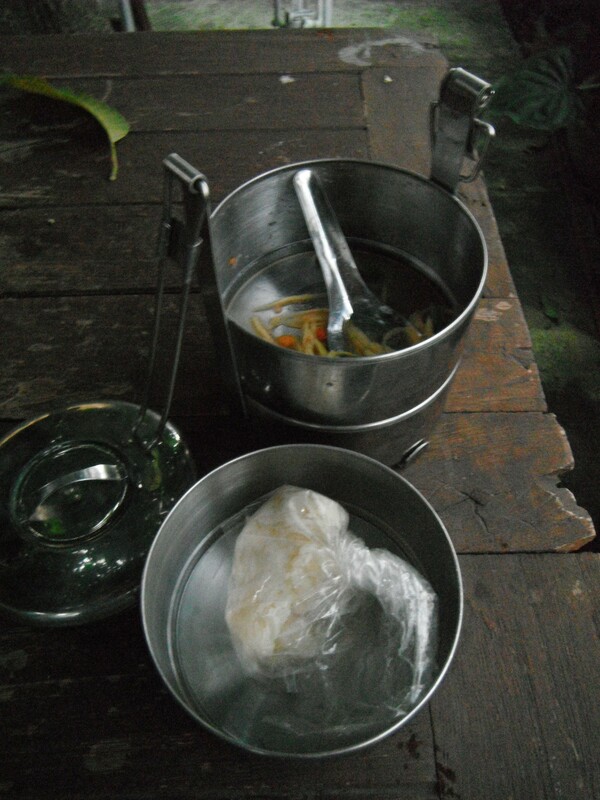 Drying herbs, fish paste fermenting, exhaust. The works. Today’s smell was the pine forest. I’ve moved north from jungles full of creepers that want to stick to you into deciduous forests with heavy undergrowth. Today I climbed over a mountain that was covered in a pine forest and my nose was full of that pine needle smell. 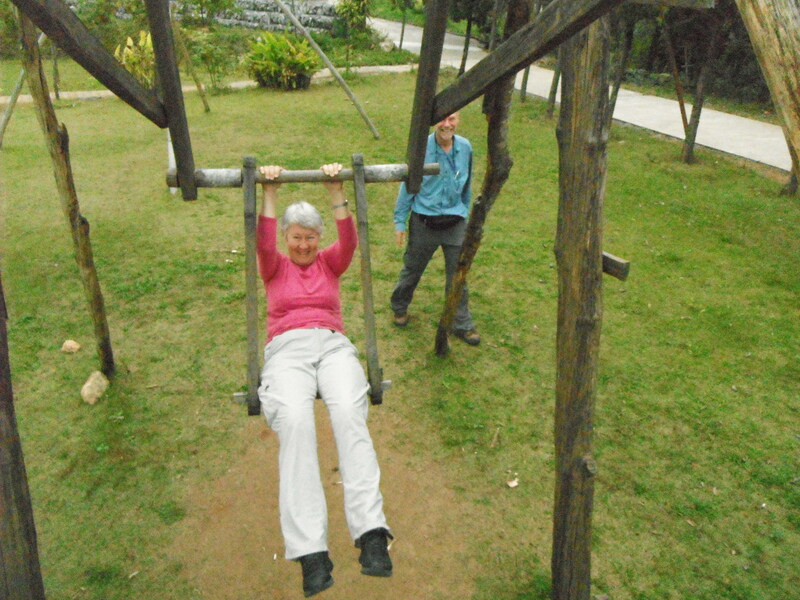 Coming from Australia, I associate pine forests with the plantations around Nanga Mill. I remember going to the US and having to comphrend that all the pine forest around the Rogue River was not a plantation, but was natural in Oregon (we call it Oregon pine after all). The riding from Mae Sot to Pai has been difficult. Thailand is proud that it was never overrun by the French, unlike its neighbours in Vietnam and Laos. However the French occupation in Vietnam brought with them quality coffee and road engineers, trained in places like the Alps. The roads in Laos especially are beautiful to ride up and exhilarating to ride down. They are perfectly graded and carve a beautiful gradient into the landscape. 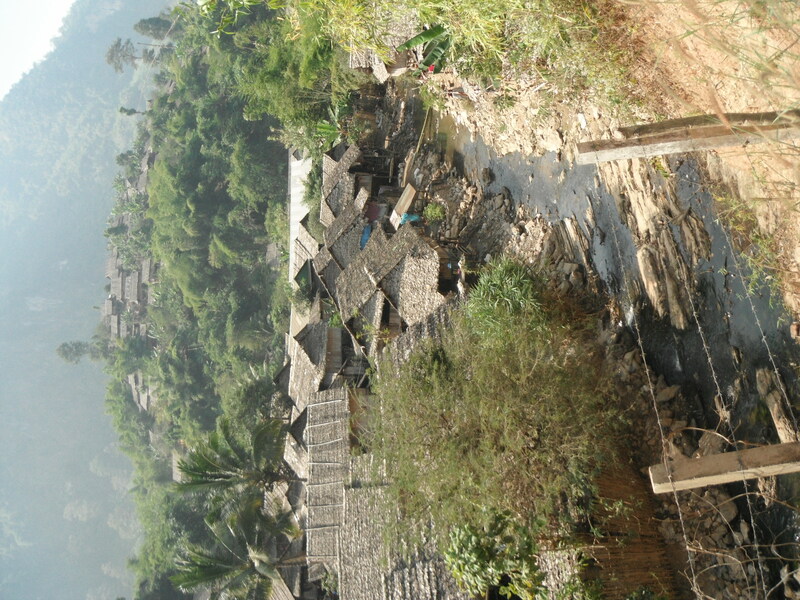 The majority of the road from Mae Sot to Pai was the type of road that has been expanded from the original goat track, following along ridges and dropping down to streams so the goat could get a drink. There is no fear of steepness on the way up or down. Some inside corners will be at 60-80%. The hills are punchy and make you sweat up them then squeeze the breaks all the way down. On a motorbike they may be great, but on a bicycle they are hard work and not particularly rewarding, especially after a bad coffee that morning. At the end of the day you have statistics like; Average speed 14.7km/h. Maximum speed 74km/h. Maybe that is why I have seen 2 groups of cyclists and yet countless foreigners touring on motorbikes. The cyclists will stop for a chat, we have a bond. But the motorbikes deny my existence. I think to a motorcyclist, I am the leprosy victim that lost my engine. If they make eye contact with me then they risk suffering the same fate, therefore it is safest to look at the opposite kerb and rocket past as fast as possible. However, 40km out of Pai everything changes. From Sopphong to Pai the road is awesome. The French must have had a temporary outpost there. It climbs from 650m to 1500m then drops into Pai at 700m. I was climbing it at the end of the day when the sun was getting low and orange was appearing in the sky. The forest changed into pine trees bringing back those memories of travelling in the USA and all of a sudden the motorbikes got over their leprosy fears and began to wave and acknowledge me. “You are David.” was his opening line as I sat at dinner. “Nope. Sorry, I’m not David.” as I looked up at a local guy. He kept talking. “I have a friend Sally from Australia”. I didn’t feel like explaining the 21 million people concept to him (my apologies if I do actually know you Sally). The conversation evolved on. His English was reasonably good but conversation was awkward. He was from an ethnic minority, Arakn, originally from Burma but now living in a refugee camp in Thailand. I had cycled past one of the camps that morning between Mae Sot and Mae Salit, it went for about 3km alongside the road. It apparently houses 60,000 people and has been there for around 20 years with people surviving largely on aid handouts. There was a barbed wire fence that was as much of a thoroughfare as the official entries points with Thai guards at them. Every now and then among the brown of timber houses and leaf roofs you would spot a US Aid sticker on a toilet or equivalent UN or Thai logos. I said hi to a couple of kids in the area, the schools must have a lot of English speaking volunteers because their English was perfect and confident. 2) The Arakn kindom was overthrown by the Burmese in 1784, similar in time to the first fleet arriving in Australia. He started talking about how they were fighting for their freedom. His objective was to have the kingdom of Arakn reinstated after 200 and something years. He was not Burmese and did not want to be a part of Myanmar. He was Arakn and wanted his own country. He had that passionate twinge in his voice but stumbled on facts like he was trying to recite what he had been told. Then it came out that that he was military. Military that isn’t representing a country is generally called Militia, but I’ll leave the definitions up to him. David, that he initially mistook me for, was an American and a Military Trainer. I’m not sure exactly how that works. American military trainers working in refugee camps sounds a little scary to me. I sincerely hope he is a passionate aid worker rather than American army training militia. I steered the conversation away from an Arakn military coup and independence movement and onto the pro-democracy movement. “No!” he said firmly. “Aung San Suu Kyi is Burmese and represents the Burmese League for Democracy. She does not represent my people.” He does not see the prospect of democracy as an opportunity for his people to have a voice. However he did seem to be waiting for the removal of the military junta and a softening of the oppression against his people as an opportunity to rise up and reestablish their sovereign state. I thought about trying to explain democracy 101 but decided against it. I don’t know the whole picture when it comes to politics in Myanmar, ideal outcomes and how Myanmar would fair if it splintered into 9 countries. But the conversation left me feeling a bit worried. I think so many people in the world have high hopes right now for positive change in Myanmar. I hope that it can happen but it is a huge task. Excuse me. Is there a hotel near here? I am learning that Thailand doesn’t like to write the word “Hotel” or “Guesthouse”, which is fine except that whatever they do write is in Thai script. Basically, I have no idea of how to find a hotel without someone pointing directly at the building for me. The universal charade for I’m looking for a hotel is the hands under the head. Universally recognised. My entrance into town is typically to ride around a bit and look for something obvious before starting to ask people for directions. In Khlong Lan, the second person I asked started saying “Farung. Farung”, meaning westerner. but she wasn’t looking at me. She lead me across the street to the house of a German guy living with his Thai bride. After some niceties in broken English his wife went to see if her other neighbour would rent her spare room for the night. The German took me for a sightseeing tour of the area on the back of his motobike. He was a native to the right hand side of the road, hadn’t grown up on 2 wheels and took up the space where the first three people normally sit, leaving me to squeeze on the very end of the pillion seat. On our tour his back story started to come out. English vocabulary was basic and any quantity was “too much”, it applied to land, money, water (flooding) and potatoes, a word he must have been taught by an Irish man. He met his now wife in Pattea, a seaside town south of Bangkok famous for its massage parlours, boom boom, lady boys and old men that go chasing all three. She was a massuese, they got to know each other, lived together in Pattea for a while before moving north to quiet little Khlong Lan at the base of the mountains. In his tour he pointed out the houses of the Australian man, Swiss man, French man and others that lived in the area. We tried dropping in on a couple of his friends but the husbands were away (in Pattea) leaving the wife at home with the small children. I started to get the impression that perhaps Khlong Lan was were ex-masueses went whilst they waited for their retirement investment to mature. If you ensure your diet is high in fat and the local hospital doesn’t have a good cardiac record then your investment plan will mature sooner. My hotelier for the night was once married to a chinese (pronounced shiny-se in German english) man before he died. She may have ‘too much’ money now but I didn’t see her smile much. Finding a hotel in Tak was a bigger ball game because there were expensive hotels that I could find, and in-expensive ones I couldn’t find. But they all advertised with picture billboards and random direction arrows, all I had to do was follow the arrows of the dodgiest looking signs and I’d be okay. I tried to follow some arrows, gave up and asked a bit and then a bit more. Eventually a guy spoke English. “The white building just there”. As I rolled into the car park I still couldn’t tell it was a hotel. The first room they gave me had a shower with no pressure and a vintage hotwater system that was just for looks. When I changed rooms the friendly guy helped check that the shower worked then, as he was leaving, tried his english on me. “Beautiful . . . ” he started rubbing his arm “beautiful . . . . massage for you”. I hardly needed to say no, I think he saw the fear in my face and left promptly. However, things are looking up. I met a cyclist called Dan from America. We were travelling opposite directions and stopped for 10 minutes to chat. I told him my problems in finding hotels and he said its easy. “Just look for the sign saying ’24’. They’re normally about 200-250 baht. Just make sure you get the rate for the whole night and not the hour”. Problem solved. I’ll see how it goes. My. That’s a lot of stuff. 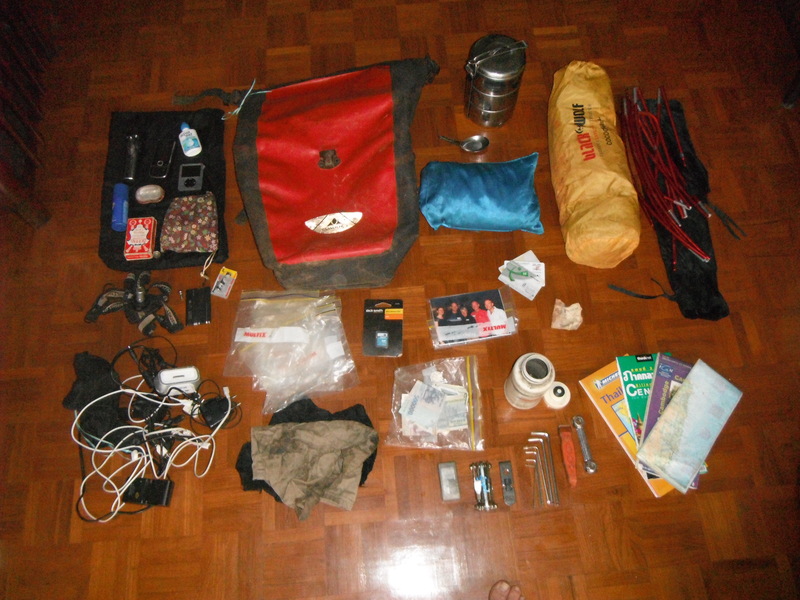 I’ve been wanting to explode my bags share with blogland what I’m carrying and what goes where. I’m staying with my cousin Rae in Bangkok for a few days and a lazy day of nothingness has given me the right opportunity. Everything moves around a bit and its washing day. But this is the general idea. This is my day to day bag, the satchel that comes with me when I leave the bike. Its the bag that I open every time I want a snack (got none at the moment) or get confused as to where I am. Passport, kindle, a book (I don’t recommend this one), sunscreen, journal and chain lube. Camera, wallet, phone and keys come and go. The opposite side of the bike to the previous and the opposite end of the spectrum. This is the bag I never open, however never seems to come along quite regularly still. 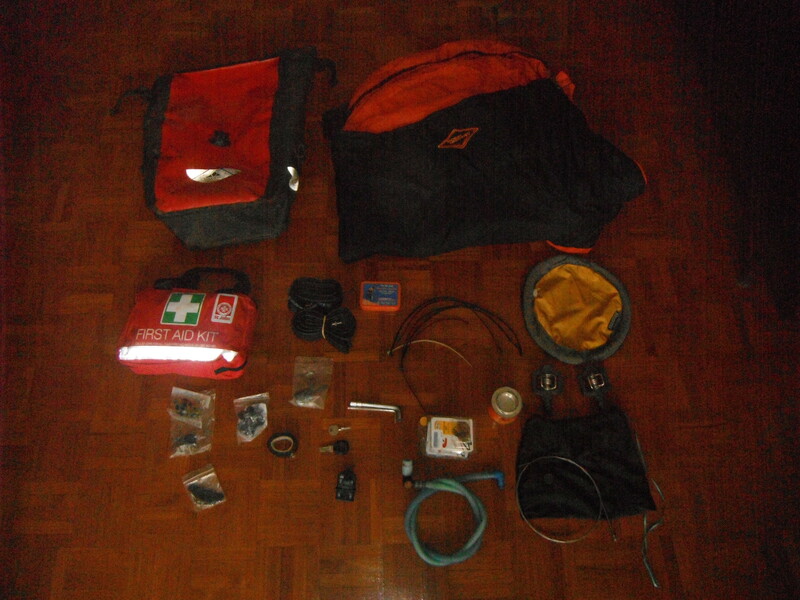 In this bag are my sleeping bag, first aid kit and spare parts. I also have my frisbee in here. I think I’ve used the frisbee once so far as I’m generally one friend short of the required number for catch and throw. The spare parts include 2 tubes and a puncture repair kit, spare brake pads (2 sets), spare pedals (I’ve had too many issues already), spare keys and most importantly, my trusty contact cement. In a day of panic I picked up a cassette removal tool, I’d read about a guy who broke a spoke on the drive side of the rear wheel. He was carrying spare spokes, but had to get the cassette off before he could thread a new spoke through. He ended up on the bus for the next 2 days. Back Left: All that stuff. Some things don’t fit into a category and these things go in this bag. 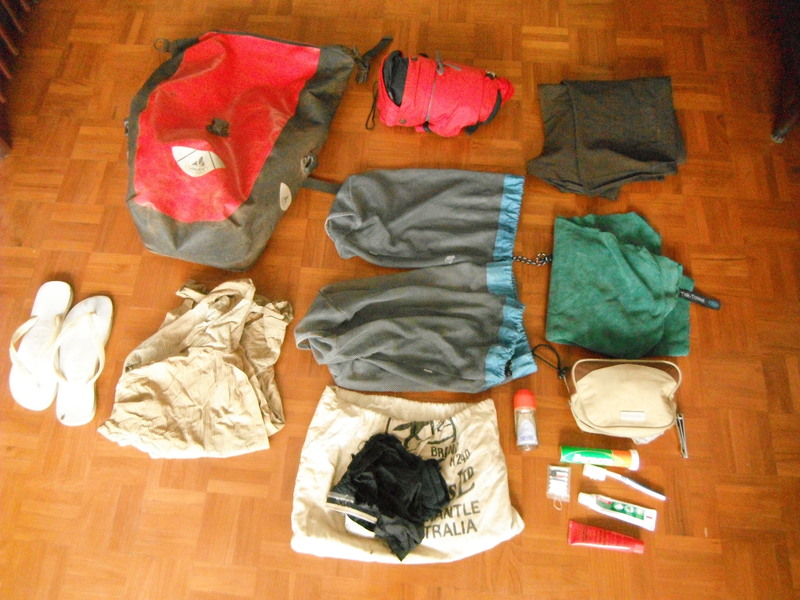 I have my tool bottle and a rag for the bike, a bivvy tent (used once so far) and sleeping sheet for me. I have a tower of tins (tiffin) that I’ll often get a take away lunch in when I get breakfast. Just after taking this photo I went and culled the number of cables in the bottom left corner to about a half, I had duplicate USB cables, Australian plug cables and cables from the camera I no longer have. As you can see from the bottom of the photo I also carry a spare big toe. Today is washing day. You will have to believe me that I do have clothes which is more than I can say for the French cyclist I met on the beach in Koh Rung. Somehow, I managed to find a laundry that charges 3 times as much and takes twice as long to wash clothes than anybody else. I’m not sure what I’ll wear out tonight because I’m on day 3 already for this shirt. My toiletries kit includes the ever faithful paw paw ointment and berocca. Both are very good to me. The raincoat has been pretty useless, on the bike you sweat too much for a raincoat but I still don’t dare to throw it out. Apart from the bags, I have the bike, helmet, cycling shoes, two locks and a camelback. The camelback carries 1.5l of water and I have a holder on the frame for another 1.5l. If I need more than that then the water goes in or on the rear bags. 6l of water is the most I’ve carried at any time. So, thats my world at the moment. Tine and Wim from Belgium have a better look at their equipment. In Vientiane I needed to buy some contact cement, that glue where you coat both pieces and let it tack dry before pushing them together. Trying to find it using charades was not looking promising but somehow I spotted a shop selling faucets and figured it was a good enough link to being a hardware store. When the lady understood my charades and pulled it off the shelf I could hardly contain my excitement. Ryan would say I didn’t. After the ordeal of finding it, I decided it was best to hold onto it just in case. My chain has stretched to the point where it skips in the big gears. I replaced the handlebar tape a couple of weeks ago. I’ve somehow got rust coming through the paint on the top tube. 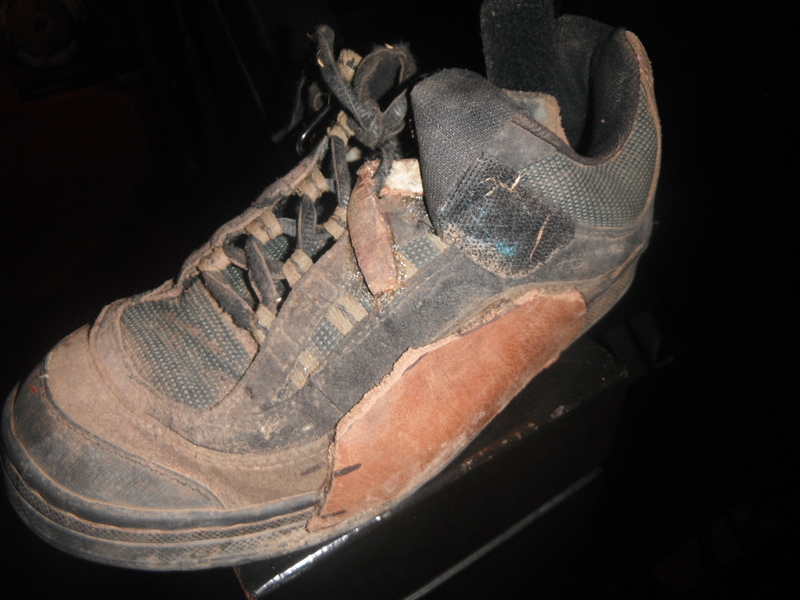 To add to the list, the cleats in my shoes that clip to my pedals are worn out too. My kindle is also broken and will be replaced soon. But my kindle is where Lonely Planet of Thailand is. Lonely Planet would not only have told me what sites to see and what not to see, but also translations for words like ‘hotel’ which I still haven’t worked out. The map I have marks towns in categories where the smallest is <50,000 people. Hence large stretches appear to have no civilization but infact have shops and restaurants every 10km. There doesn’t appear to be much correlation between the map and reality anyway. All this, and feeling a bit isolated, left me feeling pretty worn out too. But the good news is that Bangkok has all the answers. Kindle replacement is waiting, there are big bike shops with new parts, I’ll be able to find another map that maybe even writes towns in Thai font too so the road signs make sense. My cousin Rae lives here so I get a familiar face as well. The problem was how to get to Bangkok from Hat Lek on the coast where I entered Thailand, its a huge city and my only resource is a map that only shows the massive green roads and a city area map of a random section of city. Instead of following the coast around on major roads, I decided to head north, following the border, then cut across. After a couple of nights in Trat 100km in from the border, I left and went north. I miraculously appeared in Pong Nam Ron, which was intended, but I’d passed things such as a huge dam that wasn’t marked and got spat out on a highway about 30km from where I thought I was. If I had a trusty lonely planet with me, it would have told me it is an area with only ‘resorts’ and golf courses. Pretty, but not the sort of place that worked for my budget. Adventure day 2 and I was still heading north with tailwinds, good roads and reasonably flat. Good fast riding conditions, but I had a certain uneasiness. There were tourist signs pointing to waterfalls and elephant spotting but no indications on how far or how much or how good. On a bike a few km detour takes up a good chuck of your day. 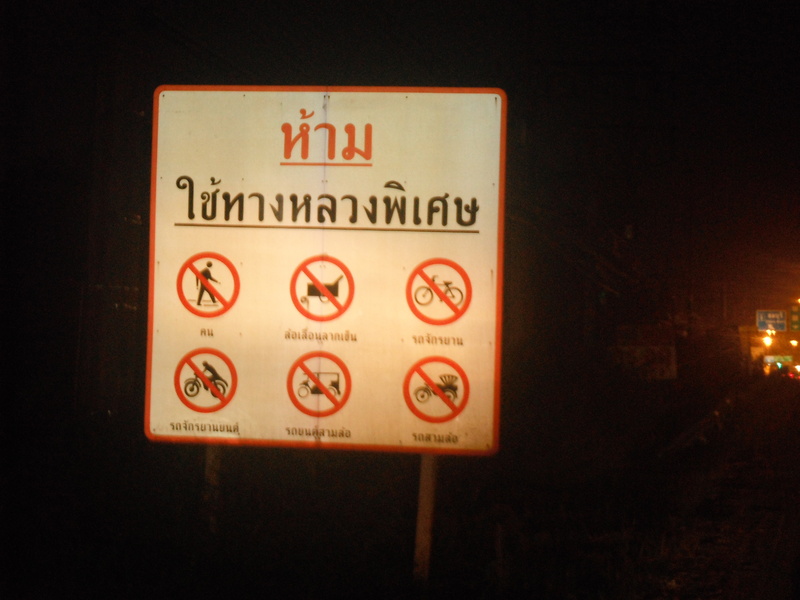 After 65km I came to the junction where I had to decide how to get to Bangkok. North and into major highways, or West along a road supposedly devoid of all life (according to my map). 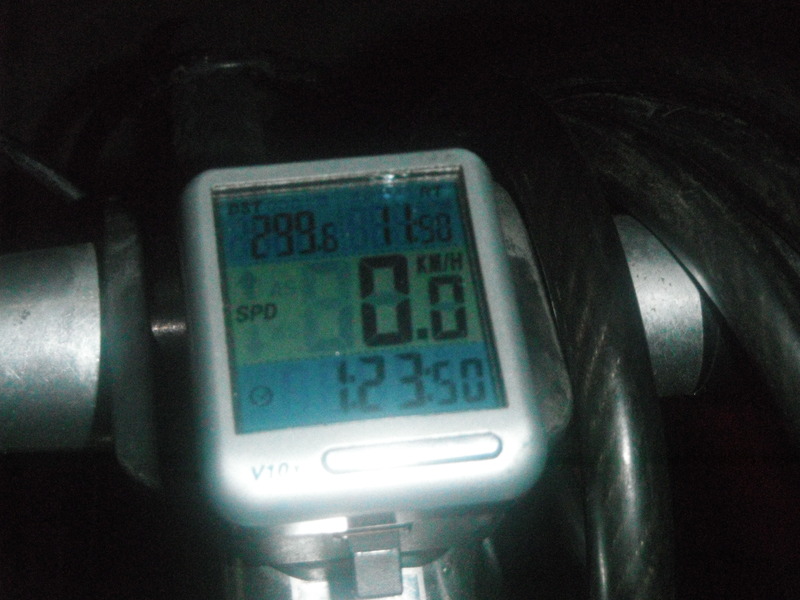 It was 134km to the next town marked. Could I cover 200km in one day? I turned west and then started thinking about it. The road was still relatively flat and fast moving. Now follow my thought process, my logic is perfect. In Luang Prabang, Ryan and I met Ben. He was German and a really interesting guy, traveling by himself for a few weeks on bike. The previous day he had covered the ~130km to his destination by mid afternoon, decided he didn’t like the town and thought he may as well keep going to Luang Prabang. 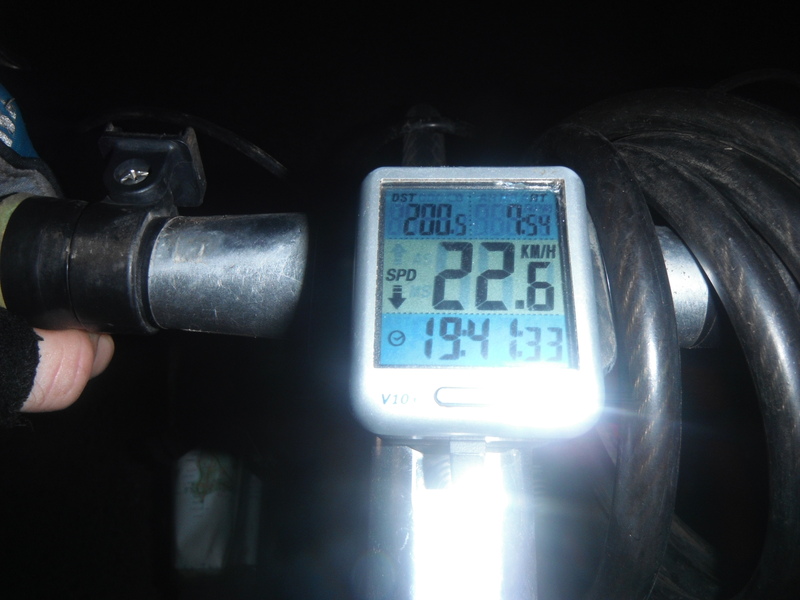 200.2km was the total. When we met him he was walking like a cowboy and couldn’t sit in his saddle to ride. Ryan and I discussed how possible it would be. Ben had hills, I had flat and tailwinds. The counter argument is the Race Across America, where they cover twice the distance of the Tour de France in half the time. The do epic distances every day for a fortnight. If you ride for enough hours then you can cover a lot of ground, simple. Now, number 1. Riding 200km in one day was going to get me to a town that should be big enough to have a hotel, but still left me 120km outside of Bangkok which is more than I’d want to do in one day. I could push on a bit further so it was only 80km the next day. But what time would I be arriving in Bangkok if I left the following morning and what would the traffic be like? Number 2. What would be the best time to get into Bangkok? It would probably be in the middle of the night sometime when there is the least traffic. In that case I’d need to leave some time in the early evening, which would involve having a full rest day in some two bit town or . . .maybe I could just push through. Once you’ve done 200km, whats a bit more. This was the only photo I took whilst riding with Semi trailers whizzing past. I got smarter after that. 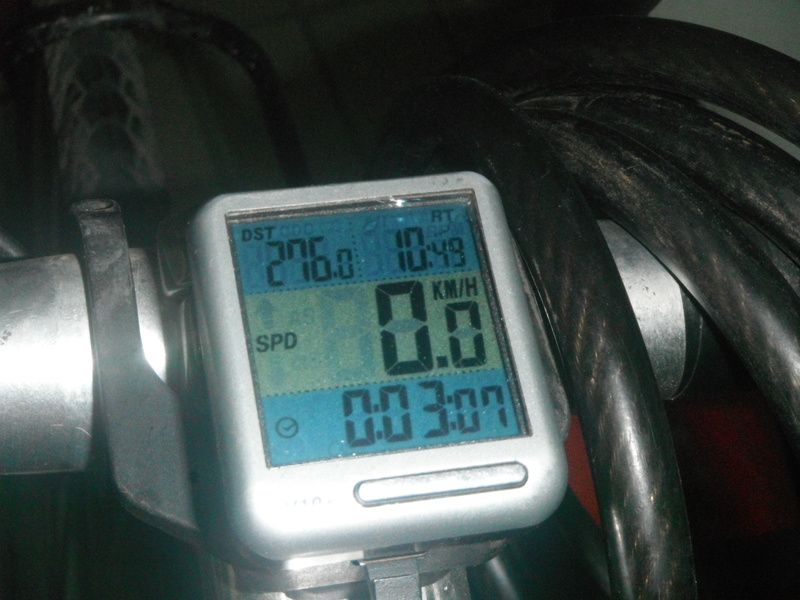 Somewhere after this 200km mark I stopped in at a service station for water and some food. Whilst sitting on a bench out front a kid rocked up on his motorbike, laughed at me, pulled out his camera phone and took a couple of pics. I smiled for him. A few minutes later he returned with a couple of energy drinks and sat them down on the bench next to me, waved and walked off. I’d hate to think how I must have looked. I arrived in Khao San Rd, Bangkok’s backpacker central, at about 3 am, it was still in full swing. By the time I found a place I could afford (then found out I misunderstood the price and couldn’t, but stayed anyway) it was 3:30. 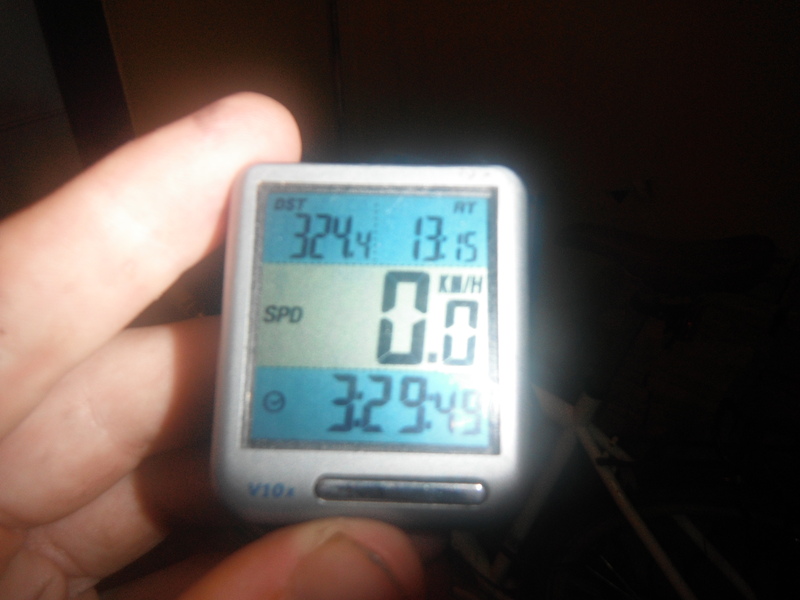 I’d covered 324km and ridden for over 13 hours. The highlight of the last 100km was heading 11km towards what turned out to be a motorway that didn’t allow bikes, motorbikes etc. so I had to turn around and go back to pick a different route in. It was a 22km detour, a touch longer than the distance from my place in Hilton to the City. Next time I’ll bring a water buffalo because they’re not banned. Its nice to know you can do these things. I wouldn’t want to do it twice. Ryans blog. Its better than mine. 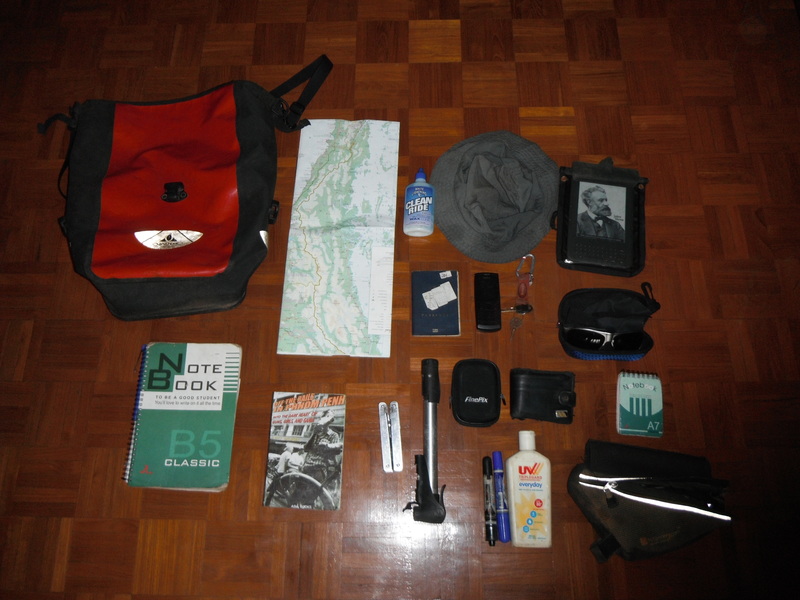 Hobo Maps – Cyclists maps of Laos.